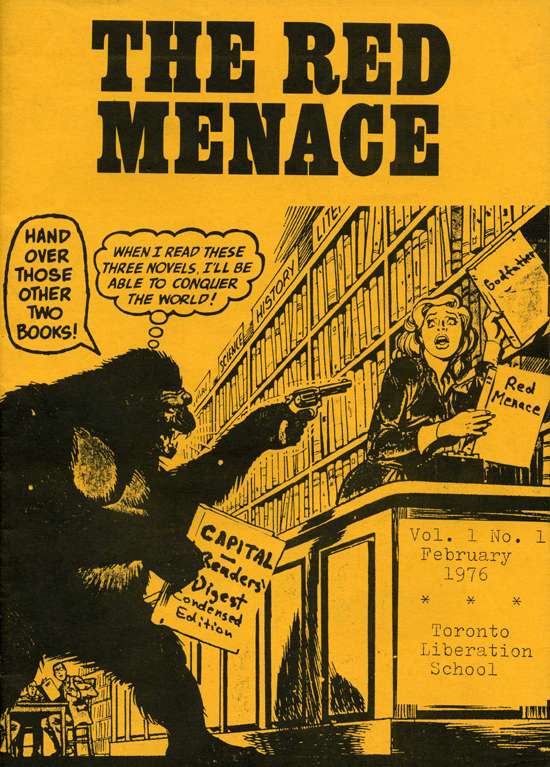 The Red Menace was published by the Toronto-based Libertarian Socialist Collective* between 1976 and 1980. 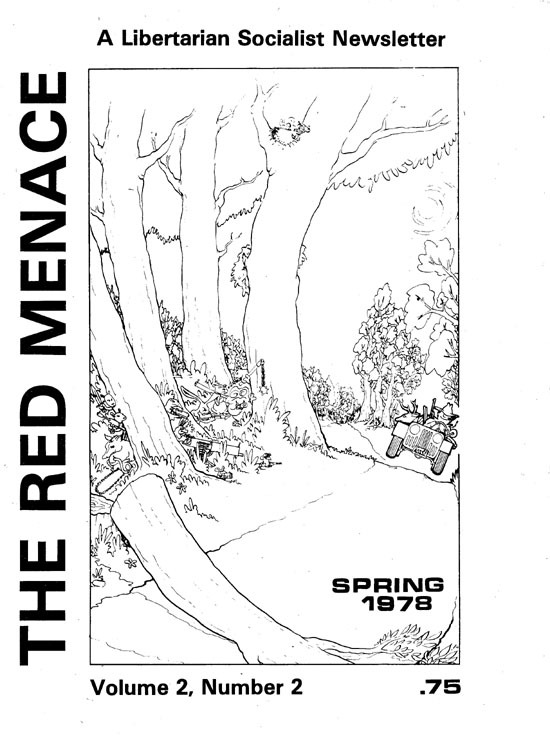 The Red Menace appeared in magazine format for the first two issues of 52 pages and 44 pages respectively; the subsequent three issues were in tabloid format, with 24, 32, and 16 pages respectively. Popular Education Conference - Overview of Popular Education Conference held in Toronto in October 1975. Looking at the Conference - An evaluation of the Popular Education Conference of October 1975. Our two cents worth... - The conference was a success to the extent that it posed problems, impelled people to evaluate their theories and their experiences, stimulated processes of critical and self-critical thinking. Popular Education Conference (2) - The level of discussion was brought down to actual examples and practice quite in contrast to the sloganeering and shallow definition of terms that is typical of most formal intra-left gatherings. Organizing in a small town - Experiences in organizing in a small town in Ontario in the early 1970s. Portugal (1975) - The revolutionary process in Portugal is not one that lends itself very easily to a coherent political analysis. Political leadership is quickly thrown up by the creative energy of the workers and peasants and as quickly discarded as its usefulness to them wears thin. Wage & Price controls - Canadian working people have now joined the ranks of workers in other western capitalist countries who have been subjected to a statutory incomes policy. Introduction to Work and Daily Life in The Red Menace - A forum through which people can communicate what they feel about their jobs and the others things that happen to them every day. A Tale of Two Offices - Daily life and office politics viewed through the experience of working in two libraries with very different management styles. 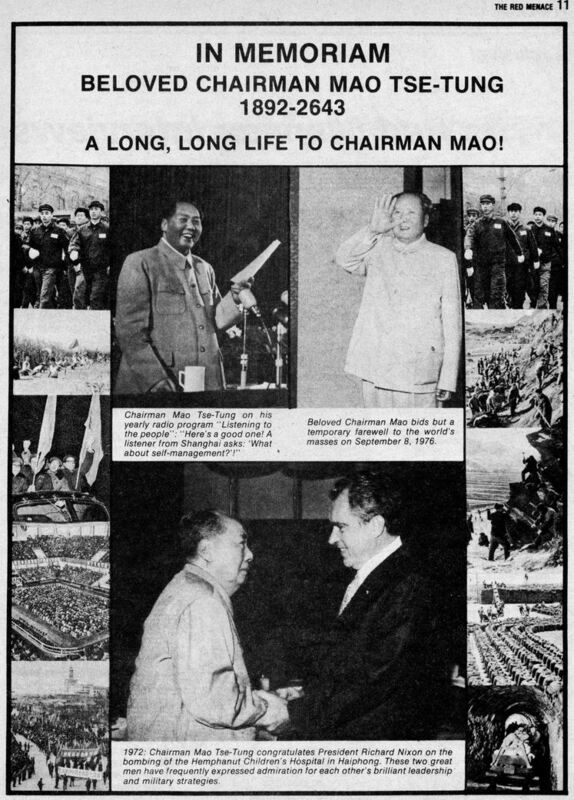 In Memoriam: Beloved Chairman Mao - A Long, Long Life to Chairman Mao. The Red Menace Interviews Prime Minister Trudeau - An exclusive interview with Prime Minister Pierre Trudeau, published in The Red Menace and nowhere else. Bain Co-op meets Wages for Housework - The story of the struggle that gave birth to a housing co-operative and destroyed the credibility of the Wages for Housework sect. What is Libertarian Socialism? - Revolution is a collective process of self-liberation: people and societies are transformed through their struggles for freedom and for a better world. Also available in Spanish. Why the Leninists Will Win - Clark argues that the failure of the libertarian left to take organizing seriously makes it likely that capitalism will be overthrown by Leninists who will preside over a social system as undemocratic as the old. Libertarian Socialism - There must be a revolt against bureaucracy - the predominant trend of societal organization. The Crisis of Dialectical Materialism and Libertarian Socialism - Libertarian socialism is defined first and foremost by the negation of political authoritarianism and theoretical determinism. Portugal: The Impossible Revolution (Book Review) - A clear analysis of events in Portugal 1974-1975. Multiphasic Bureaucratic Follow the Leader Exam - (With Built-in Deception Detector). Radio Alice - Radio in action in Italy. Communists on Wall Street - Eurocommunism in practice. Words, words, words - The misuse of language implies a failure to think clearly, to analyse correctly, to communicate with others. Write to us - The Red Menace welcomes writers and artists contributions. Anarchism vs. Marxism - Anarchist critiques of Marxism typically reveal a lack of knowledge of what Karl Marx actually wrote, resulting in sterile denunciations of a straw-man opponent. Also available in Spanish. Sources - Resources for anti-authoritarians. 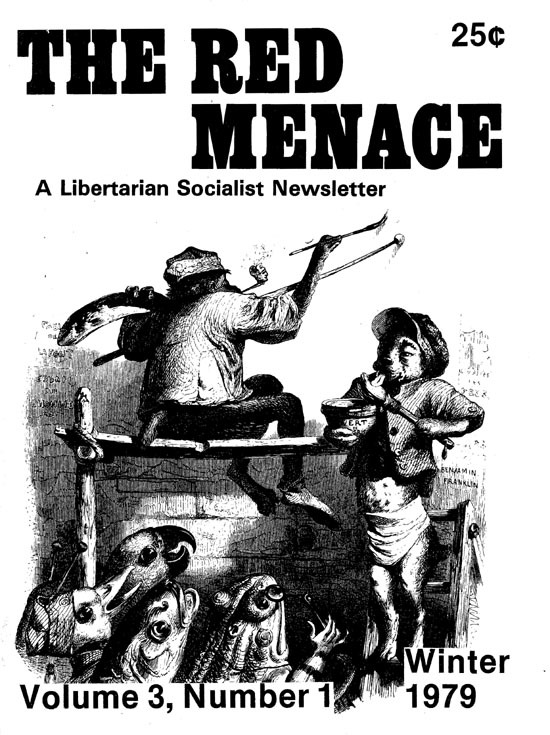 An ongoing debate - The Red Menace is meant to be a forum of dissenting views withing the broadly defined boundaries of libertarian socialism. Bakunin vs. Marx - The anarchist-Marxist split started with Bakunin, who systematically misrepresented Marxs positions. Also available in Spanish. Bookchin on technology - Murray Bookchins arguments for a liberatory technology. Some thoughts on organization - What type of organization should anarchists, libertarian socialists and libertarian Marxists be working towards? Why the Leninists will lose - The Leninist groups may still have the ability to disrupt the left, but they are long past the point of being able to achieve any kind of success in their own right. Everything you wanted to know about sects but were afraid to ask - We would rather fight for what we want (even if we dont get it in our lifetime) than fight for what we dont want ... and get it. Obscenity Exposed - The police definition of obscenity gets right to the crux of the question. The End of Dialectical Materialism - An anarchist reply to the libertarian Marxists. Bain Avenue controversy - Rent freeze organizers state their case. Ulli Diemer replies to Wages for Housework - There is no dispute about the importance and validity of economic demands, whether in the workplace or in the community. What is under dispute is Wages for Houseworks insistence that money is the only thing around which it is permissible to organize. Can the NDP be Socialist? - Simon Rosenblum argues that the left should work to transform the NDP, not ignore it. Letters to the Red Menace - Comments on Wages for Housework, libertarian socialism, workplace articles, etc. A Political Statement of the Libertarian Socialist Collective. Also available in Spanish. What Is Important? - It is necessary to demolish the monstrously false idea that the problems that workers see are not important, that there are more important ones which only "theorists" and politicians can speak about. Working in a Supermarket - Observations on working as a "carry-out" in a supermarket. West Germany: Censorship and Repression in the Model State - In West Germany, repression is now 'democratically' sanctioned and seen as a model for other countries to adopt. Hierarchy of salaries and incomes - The official ideology's justification of hierarchy does not coincide with either logic or reality. Radical Newspapers - A radical newspaper succeeds to the extent that in engages in dialogue with its readers and community, rather than in preaching. Science fiction is more than just Buck Rogers - Like most modern literature, science fiction is concerned with the alienated human condition, yet it articulates this concern in a distinct manner, as a form of literature concerned with the implications of the problems engendered by industrial society. An interview with Karl Marx - A reporter for the New York World interviews Karl Marx in 1871 about the goals and organizational methods of the First International. The proliferation of neo-primitives - Neo-primitives prefer an imaginary past to the work of creating a different society. Some of my best comrades are friends - The lefts sloppy use of language indicates sloppy thinking. The Destructive Urge - Marxism's greatest discovery is that it cannot prescribe any science of revolution, any fail-safe program. On the contrary what it provides is a new question, a new responsibility to make a choice.. I was a psychic for the FBI - The parapsychology con game. We can learn to live free - Give the human race a little credit. We can surely learn to live free, neither dominant nor submissive. The Leninist Facade - In direct oppostion to what Marx advocated, the Bolsheviks tried to institute socialism without democracy. The damage to the socialist movement resulting from this was immense. Problems with Red Menace Method - Your attempts to develop a positive alternative to DiaMat Marxism and Marxist-Leninist sects suffers from a polemical method which reproduces the very problem you want to get away from. Bakunin vs. Marx - Sam Dofgoff responds - The debates between Bakunin and Marx transcend petty personal squabbles and embody two diametrically opposed tendencies in the theory and tactics of socialism, the authoritarian and libertarian schools respectively. The Continuing Debate - We should subject both Marxism and anarchism to a critical analysis, and thereby start to provide the basis for a libertarian revolutionary movement that relates adequately to the needs and problems of today. Letters - Red Menace 4 - Letters to the Red Menace. What Bakunin said - Letter quoting Bakunin. Point of Order - Letter on dialectical materialism and on lefty language. Critical Distance - Letter: anarchists must make a choice. Read Before Attacking - Letter: too quick to attack. Letter - Praise and criticism. Letter - Fight back or put up with the system. Arms and the Woman - The modern revolutionary movement must destroy this opposition of pleasure-activity, sensitivity- lucidity, conception-execution, habit-innovation. Back in the USSR - Impressions from a trip to the Soviet Union. Cynicism from Above - Cynicism from Below - The state bureaucracies of Eastern Europe are unable to accept any challenge to their right to decide and control. Fashion - Even though the fashion industry has made dress oppressive one should not discard it completely, or at least only an appropriate occasions. Do we really all want to walk around looking exactly alike in dull green pajamas and peak caps? Prostitution Rights - Decriminalization takes prostitution from the jurisdiction of the criminal code. It means private sexual acts between consenting adults are placed outside the realm of criminal laws. The good and the bad - What are the contemporary differences between serious anarchists and serious libertarian Marxists? It is the present historical situation that is relevant, since after all we cannot go back and change the past. So be it - Rejoinder from Sam Dolgoff. The last word - The old man in London and his critics. The quoting urge - A reader submits a collection of quotes from Bakunin. Flogging Away - A great many anarchists adopt a critical stance to Bakunin's legacy as well as towards the anarchist movement generally. Our rejection of Marxism is not monolithic. Useless pastime - Let's get down to the business of really discussing the issues: the role and nature of the State, trade unions, feminism, nationalism, sexuality, etc. Terrorism - You can't blow up a social relationship. Mancester calling - The Red Menace: very stimulating reading. Why 'consciousness raising?' - Debunking jargon. What happened to the Red Menace? - Inquiring letter. 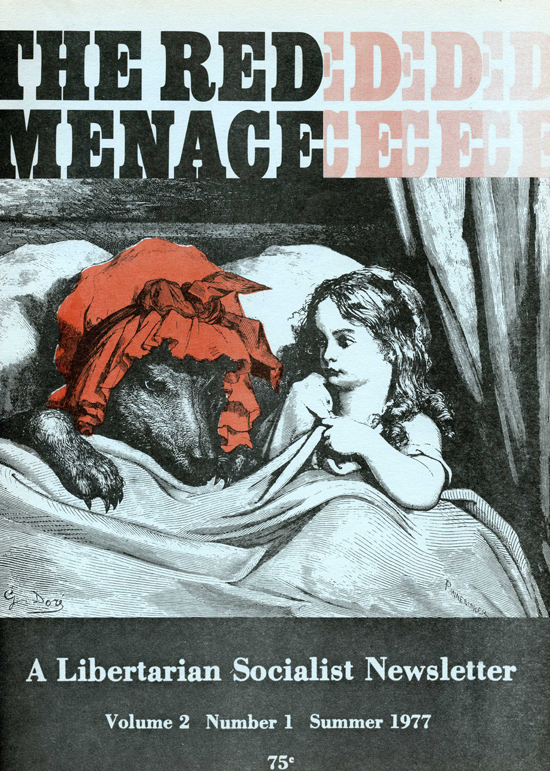 Canada's pride - One of the nicest things about my brief visit to Canada was finding Red Menace. By Golly! This is the stuff! 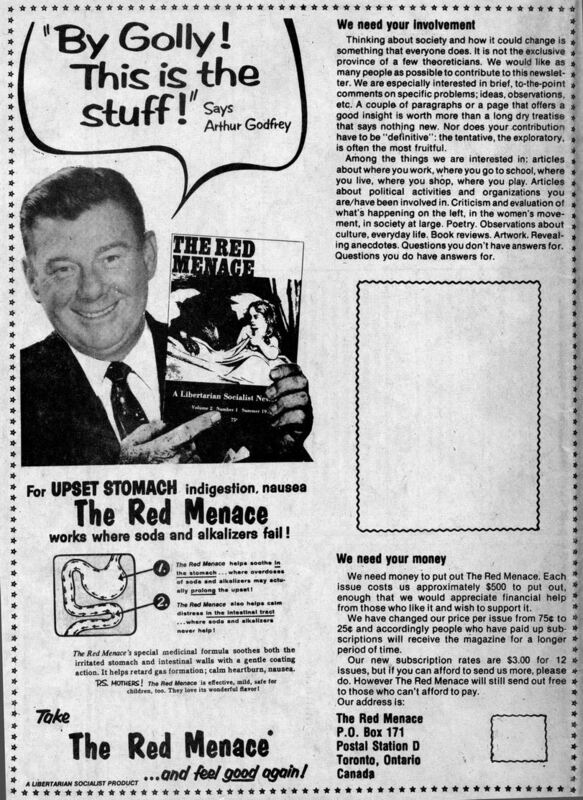 - For upset stomach indigestion nausea the Red Menace works. 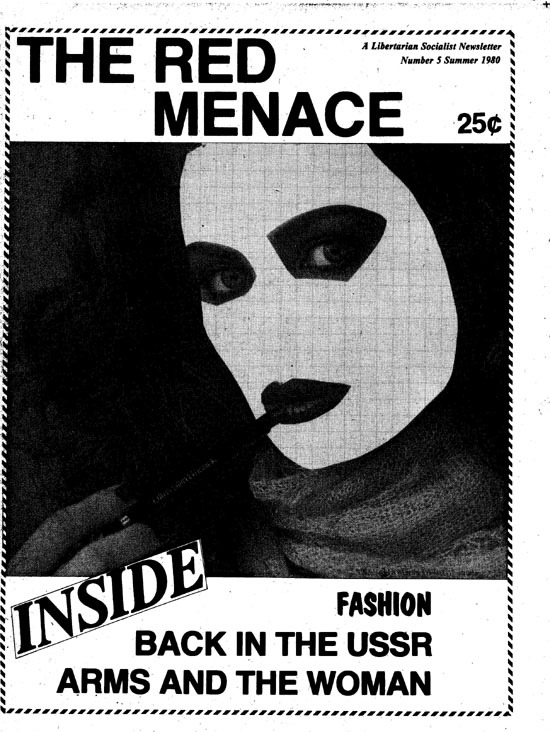 The Red Menace Web site is hosted by Connexions.